The basket bag was a fashion trend that was everywhere last year and it's an accessory that is already gaining even more popularity this coming spring/summer season! A basket bag adds a touch of chic to any outfit, whether you prefer boho, feminine or preppy fashion. They come in all shapes & sizes, are often made from rattan, raffia, straw and other natural materials, and they are available at many price points. Zara has jumped on the trend with this cute raffia basket bag with short handle, this large half circle straw tote with wooden handles and this small raffia basket bag accented with a polka dot scarf. My favourite style is the small round rattan basket bag with long, over the shoulder strap, like this one from Free People. 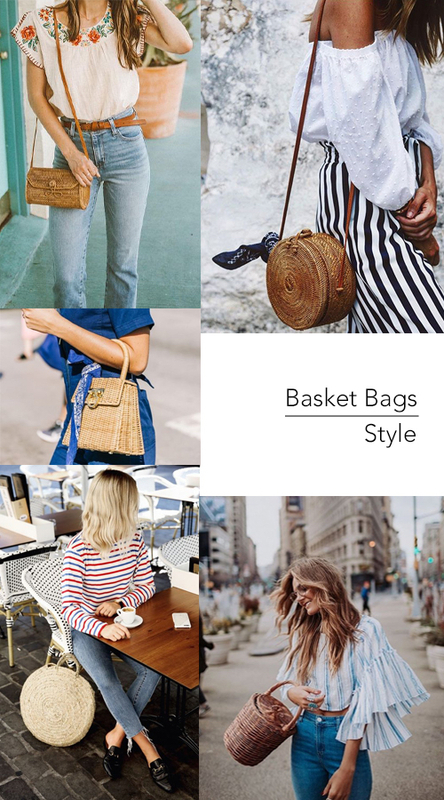 I've found more basket bag styles at affordable prices that you can shop for now and will be the perfect accent to your favourite outfits this spring and summer! Please share your comments with me! Thank you for visiting my blog! Designing Gal participates in select affiliate advertising programs. This means Designing Gal may make a small commission if you click and make a purchase through certain links on this website or any associated social media platforms. All photos are my own, unless otherwise stated, and can not be used without my permission. All opinions are my own. If you have any comments or inquiries please contact me here.